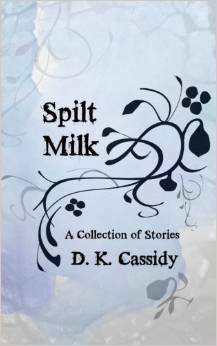 Book Review: SPILT MILK by D. K. Cassidy – ABSOLUTELY BRILLIANT! To say that “Spilt Milk” is brilliant is an understatement. This IS great writing! “Spilt Milk” is a collection of short stories, intricately interwoven in a unique and tantalizing way, keeping the reader endlessly enthralled. The prose is sparse and somehow ‘just right’ – no wasted hyperbole here. I usually eschew short stories – my preference being for that big fat book that lasts a long time. However, Ms. Cassidy’s collection is so amazing that an eBook just isn’t enough. This is one I want on my bookshelf and, to that end, I have just ordered the paperback. This work is most highly recommended – if I could, I would give it 6 stars! We’ll be hearing a lot about Ms. Cassidy in the future, I am sure!